King Arthur: It is I, Arthur, son of Uther Pendragon, from the castle of Camelot. King of the Britons, defeater of the Saxons, Sovereign of all England! Guard: Pull the other one! King Arthur: I am, and this is my trusty servant Patsy. We have ridden the length and breadth of the land in search of knights who will join me in my court at Camelot. I must speak with your lord and master. Guard: What? Ridden on a horse? Guard: You've got two empty halves of coconut and you're banging' 'em together. Guard: Where'd you get the coconuts? King Arthur: We found them. Guard: Found them? In Mercia?! The coconut's tropical! King Arthur: What do you mean? Guard: Well, this is a temperate zone. King Arthur: The swallow may fly south with the sun or the house martin or the plover may seek warmer climes in winter, yet these are not strangers to our land? Guard: Are you suggesting that coconuts migrate? King Arthur: Not at all. They could be carried. 1st soldier with a keen interest in birds: What? A swallow carrying a coconut? King Arthur: It could grip it by the husk! Guard: It's not a question of where he grips it! It's a simple question of weight ratios! A five ounce bird could not carry a one pound coconut. King Arthur: Well, it doesn't matter. Will you go and tell your master that Arthur from the Court of Camelot is here? Guard: Listen. 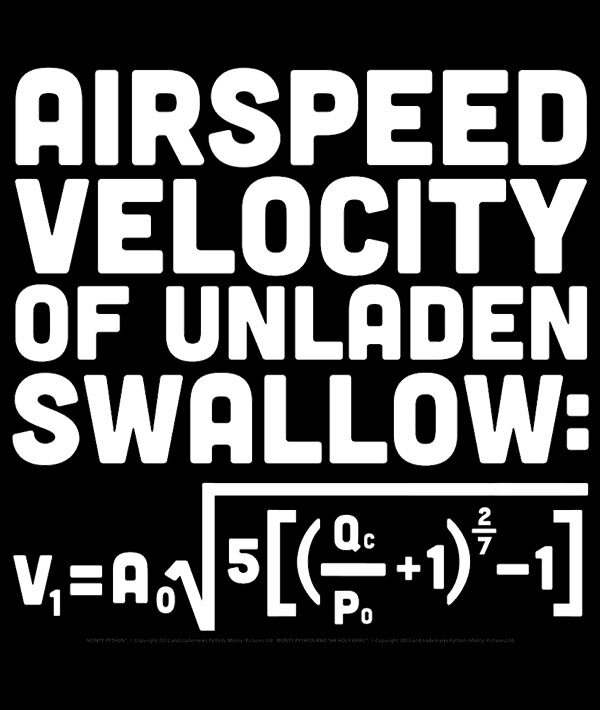 In order to maintain air-speed velocity, a swallow needs to beat its wings forty-three times every second, right? “The Grail realm” represents the primal image of the mother, the wonderous vessel. It is so self-evident that this is a symbol of the feminine”. In the film Monty Python and the Holy Grail the sword Excalibur is only referenced upon on the side. Dennis a very political aware farm worker. “You can’t expect to wield supreme executive power because some watery tart threw a sword at you.” This watery tart, also known as Morgana, lady of the lake is denied any divine interference. This is the clash between the old world and the new world. And it is best seen as a very funny joke. Dennis is very well read, and very aware of his worth. He makes the old noble King Arthur look very silly. I think that is why this is one of the funniest moments of the film. We recognize this. On one hand we are the silly old noble Arthur, claiming our kingdom, at the other hand we are rational beings. Do you like this post: Please share it and subscribe to the Mindfunda blog using the button on the left side. Another way to support Mindfunda is with these Magnificent Mindfunda shirts using this link.